Canadian Prime Minister Justin Trudeau calls The Gardens of Democracy one of his favorite books. In a post-election world with widespread political upheaval, a deep wellspring of civic engagement and collective action is beginning to emerge. Modern American life has become marked by divisive conversations about everything from racial and social justice to fighting the ever-widening income gap, environmental conservation, and how we might collaborate as active citizens to heal our democracy. 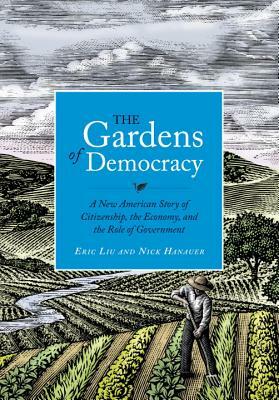 In The Gardens of Democracy, Eric Liu and Nick Hanauer outline an argument for why our most basic assumptions about these topics need updating for the 21st century. For those finding their voice for the first time, this book offers a conceptual roadmap for a way forward—for what they are resisting, why they resist, and for the better democracy they want to grow. Liu and Hanauer’s ideas are simple but revolutionary: true “self-interest” is incomplete without tending to the shared best interests of the national community. They illustrate that to model positivity, good citizenship, and ensure liberty and justice for all, we must achieve compromise by reaching across the aisle and putting the power to execute programs back in the hands of individuals, not big government. True freedom does not live in isolation, and we must redefine how we view prosperity in order to move from a dog-eat-dog mentality that perpetuates the top 1 percent to a communal and inclusive movement that illustrates that we’re all better off when we’re all better off. Timely, inspiring, and highly charged, The Gardens of Democracy is a much-needed call to action for citizens to embrace their roles in a democratic society. ERIC LIU is the founder and CEO of Citizen University and executive director of the Aspen Institute Citizenship and American Identity Program. He is the author of several books, including You’re More Powerful than You Think: A Citizen’s Guide to Making Change Happen, The True Patriot, and A Chinaman's Chance. Eric served as a White House speechwriter and policy adviser for President Bill Clinton. He is a regular columnist for CNN.com and a correspondent for TheAtlantic.com. NICK HANAUER is a Seattle-based serial entrepreneur, venture capitalist, author and activist with a knack for identifying and building transformative business models. In 2007, he co-authored The True Patriot with Eric Liu and co-founded The True Patriot Network, a non-partisan group committed to furthering patriotic ideals. He also co-founded the Washington State League of Education Voters (LEV), a non-partisan statewide political organization focused on promoting public education, where he serves as co-president.